At this time, liking or not liking or hating or adoring Hillary Clinton is not a personal assessment but a lifestyle choice. These emotional responses give us different versions of her, and during this Presidential campaign season they have become more prominent — and more relevant. This makes it difficult to write an astrological analysis that contains basic biographical information that reasonable people would agree on, let alone a coherent interpretation. These difficulties are compounded by the fact that her birth time is uncertain. 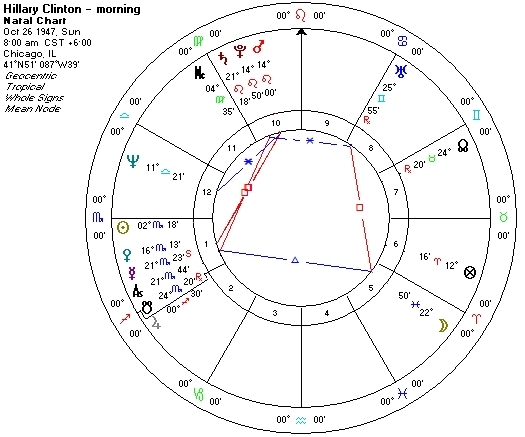 The two most-often used natal charts for Hillary Clinton are exactly twelve hours apart, 8 in the morning and in the evening. Perhaps this is not such a terrible thing, for it gives us freedom to explore different facets of this complex person. We can see how two different times of birth give us different information and then we can compare important events in Hillary Clinton’s life for clues that may validate one birth time over another. Fox News got its beginning in 1998 the year Bill Clinton’s extramarital affair became known and this new news outlet found that negative stories about the Clintons, especially Hillary, propelled ratings. Rush Limbaugh knew that his version of Hillary Clinton as “Femi-nazi” would propel his own popularity. Others in politics and the media have made a “mansion industry” (not my phrase) out of negative public ity about the Clintons. Hillary’s opacity and personal defensiveness (as opposed to Bill’s charm) has never helped matters – to this day. The content for over twenty years has included Vince Forster, Whitewater, Benghazi, those damn emails, and now the Clinton Foundation. Consuming daily doses of negativity toward Hillary Clinton makes it difficult for many to vote for her in 2016 in spite of the repellant quality of her main competition. There are others who dislike or don’t trust Hillary Clinton but with a different agenda: they see somebody who talks good progressive pronouncements but without conviction, who hangs around with people who have a lot of money and who use their money to gain special favors for themselves. They see Hillary as the once-high-price lawyer, on the Board of Directors for Walmart, with her close ties to Goldman-Sacks and similar enterprises of poor repute. They see somebody who, on account of a cautious personality or for more cynical reasons, is slow to take on progressive causes (e.g. gay marriage, income inequality and Wall Street) but will sign on when becomes easy to do so. They are also wary that a President Hillary Clinton will let Bush’s Neocons – the same people who brought us the Iraq War – in through the back door. Is Hillary Clinton a feminist? If you look at feminism as extending to women the worldly prerogatives usually reserved for men, like being US President, she certainly has all the qualities. She has been an outspoken proponent of the human rights of women world-wide, and in some ways her book It Takes a Village brings a community spirit into American feminism. However, her decision to stay with Bill in spite of his many wanderings has also called her feminist outlook into question. Contrasting both versions of Hillary is the portrait that focuses on her decades-long work in on child care, families, and unfair treatment of women worldwide, noting her ability to make progress on these issues in a variety of roles and under difficult circumstances. They see her effectiveness as a Senator and then as Secretary of State. For those who think she’s not a very good public speaker, they note her performances that ranging from her Wellesley College commencement address in 1969 to her brilliant speech in Beijing in 1995 on women’s rights being human rights, to some of her work this year on the quality of her main political opposition. There’s been enough written about her and I don’t want to add more to the blizzard of words written about her, but let’s compare what we know of her to the two astrological charts that are commonly used for her. I will present the morning chart then note the differences made by the evening chart. Is Hillary Clinton a Morning Person? This chart is a visual wonder: five of seven visible planets are in the strongest of the angular houses and in fixed signs, attesting to an active role in her world and a stubborn and strongly durable person. According to this chart, she will not only outlast her adversaries but she plans on outliving them. Instead we begin with Mars, the traditional ruler of Scorpio. Hillary’s Mars in Leo and the Sun in Scorpio are in each other’s ruling signs, a strong mutual reception that augments a Mars-like personal style. Ordinarily Mars affiliated with Scorpio yields a quiet fighter, one who keeps the sword in the sheath except for when it is to be used, and when used the sword has strength and accuracy, and then gets put away. Nobody has confused Hillary’s reticence and secretiveness for passivity. 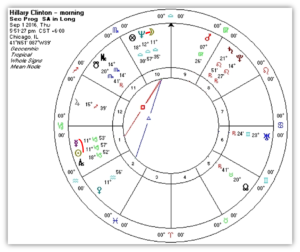 Hillary’s Mars is in masculine Leo; in a daytime chart, Mars is the malefic out of sect and this can cause her problems. Her anger and aggressiveness can come out as resentment, as contempt for those she feels have done her wrong. President Nixon may have had an “enemies’ list” on paper but Clinton has a one in her head. Mars in Leo by itself has self-righteousness based on being on the side of good vs some others who are evil. Lot of Fortune in Aries, with Mars also in charge, and this suggests using Mars for personal material gain. (Note Jupiter in the Second House – her version from “flat broke” may differ from yours and mine.) Have I mentioned that Pluto is also right next to Mars? Not only is Mars in close square to Venus in Scorpio but the two planets are exactly equidistant from 0◦ Aries/0◦ Libra, the equinoctial points and this brings these two planets even more tightly together. Here is a fiercely passionate person who does not regard sexuality frivolously but will also stay married to Bill Clinton. (Venus is her Seventh House ruler in this chart, placed in the First) I wouldn’t dwell on Venus in Scorpio being in detriment – Venus is in its own triplicity (water element in a day chart) and its own Ptolemaic terms. Mercury and Saturn are not only in square to the degree but just five minutes apart – together they signify mental discipline and a concreteness of thought, not exactly an expansive nature or a “vision thing”. This prevents her from having the inspirational force of an Obama, a Bernie Sanders or even a Bill Clinton. Instead she prizes herself as a “progressive who gets things done” or as somebody more “servant” than “public”. Because Saturn is the malefic in sect (diurnal planet in a day chart), it is the more positive of the two malefics. Nobody discounts Clinton’s self-discipline and ability to focus and work hard at a goal. Yet the Saturn-Mercury square may also hinder her ability to communicate spontaneously, especially in public settings – this is clearly a skill her supports would like her to improve upon. Mercury is stationary about to go retrograde, is in its own terms, and is very close to an Ascendant for this birth time. This should not surprise us, for nobody has ever questioned her intellect. The (more distant) squares from Mars and Pluto can give a quiet ferocity but also a cynical outlook that may presume the worst in others. However, Mercury also has a close trine from the Moon and this argues for another dimension. Clinton’s Moon in sensitive and empathic Pisces in the Fifth House can bring an intuitive and uplifting quality to Mercury. Listening to her discussing her parents and daughter and her work on behalf of children and families, her Pisces Moon shines strongly. I am not surprised that she seems to be at her best seated at a table with a small group of people, and that she has assembled around her a fervently loyal group of friends who vouch for that aspect of her character. Hillary’s political interest in children and family issues may also relate to the Moon’s applying square to Uranus. I remember a talk she gave many years ago – at a Democratic Convention? – where she endeavored to show how governmental policy effects the quality of peoples’ everyday lives. This is a lunar concern that seems her strength as a politician and public leader, and perhaps it’s also how the square from Uranus expresses itself at its best. Her Lot of Spirit, equidistant from the Lot of Fortune to the Ascendant, falls in early Cancer, governed by the Moon. In spite of the strength of Mercury, Mars, and Saturn, perhaps Moon in Pisces is where she truly lives. Here’s the main competition for the morning birth time for Hillary Clinton – 8 PM! We’ve already gone through the planetary combinations that are common to both charts. Since no planets change signs between the twelve hours between birth charts, what are the differences between the two charts? Here’s the evening chart. The square of Uranus to Moon has far more prominence in this chart, since Uranus is now conjunct the Ascendant, and becomes a signifier of her personal style. Moon in Pisces is now in the Tenth House of career. This placement puts her work on children and families front and center but Uranus’ placement gives personal qualities of impulsiveness, genius, and unconventionality. Moon in Pisces in a night chart is wholly in sect: in the public place of the Tenth, I would have expected her to be publicly a warmer and more compassionate person. Perhaps these qualities are reserved for more intimate settings. We need to look at Mercury Aside from being in the Sixth, Mercury keeps company not only with Venus (as in the AM chart) but also the Lot of Spirit. The place or sign of Lot of Spirit, the “Lot of the Sun”, indicates the choices we make from the inside. If, following the Hellenistic tradition, you look at the sign Scorpio as a First House for this Lot’s activities, we have much planetary artillery not only in the Lot’s First House Scorpio but also its Tenth that is Leo, which includes Mars the ruler of Scorpio. This makes for a great deal of personal resolve and hiddenness of character that can be sometimes at odds with her public personality. On the other hand, the Lot of Fortune, in Aquarius governed by Saturn in Leo, does not seem to be an important factor in her evening chart. So far we haven’t been able to explain the prominent role of Bill Clinton in Hillary’s life. 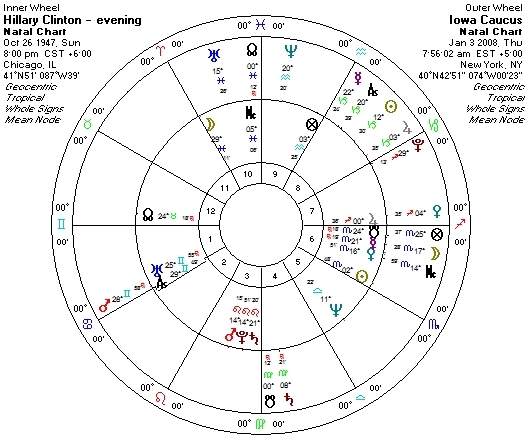 The obvious place to look in Hillary’s evening chart is Jupiter in Sagittarius in the Seventh. When, as a young lawyer Hillary worked on children’s legal issues and in 1974 an advisor to the House Judiciary Committee that was drawing up articles of impeachment on Richard Nixon, she had a politically ambitious boyfriend. After President Nixon resigned in early August, Hillary could have pursued her own successful career in Washington, New York, or Chicago. Instead she moved to Little Rock Arkansas to be with Bill Clinton and they were married the following year. Of course Bill became a rather successful politician, befitting Jupiter in Sagittarius in Hillary’s Seventh House, and Hillary rode on his success, indicated by Jupiter in the Seventh ruling Pisces, the sign of her Tenth House of career. These considerations lead us to marvel that Hillary continued to maintain her own calling, before and after Bill was US President. There are some arguments for using this evening birth time with a Gemini Ascendant over the morning birth time with a Scorpio Ascendant. The evening chart yields a more congenial public style (Moon in the Tenth), an unconventional personal style (Uranus conjunct Ascendant), and a more introspective and hidden quality to who she is. The PM chart does place Bill Clinton prominently in her life, unlike the AM chart, but does not account for the role of money in her life. Where you place Jupiter, the Second or the Seventh, may influence which chart you prefer. I want to keep this simple and look at some of Hillary’s transits, progressions, and an ancient planetary period system called “decennials.’ Let’s start with transits. Again we begin with the morning chart. 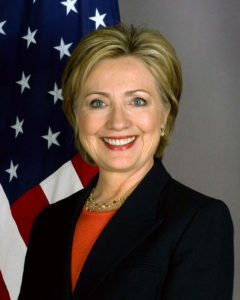 Hillary Clinton became a nationally-known figure, a “household name”, in the winter of 1992 as the high-powered and articulate wife of Bill Clinton who was on his way to becoming Democratic Presidential nominee. In light of revelations about a previous affair, a (politically) brilliant and controversial Sixty Minutes appearance by Bill and Hillary bestowed on the latter legions of supporters and detractors along lines that continue to this day. Yet this would have not been life-changing unless Bill became a national figure. 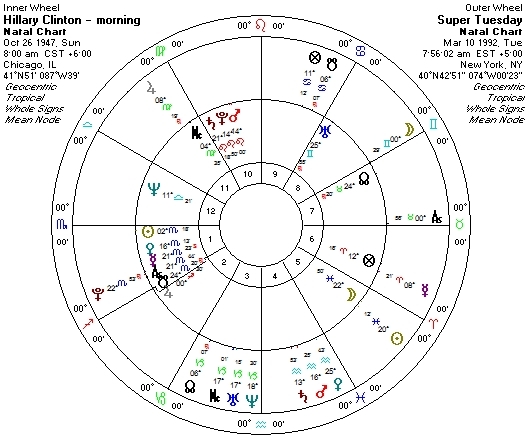 Here is a bi-wheel of Hillary’s Scorpio rising chart and the planets on “Super Tuesday” of that year, the day that made Bill Clinton the front-runner for the Democratic nomination and cemented Hillary in the nation’s consciousness. Here are transits to her PM chart for a time much later. In 2008 Hillary Clinton was running for the Democratic nomination for herself against Barack Obama and others. In early January it was quite the shock when Hillary, widely predicted to capture the nomination with relative ease, lost the Iowa caucus, coming in third after Obama and closely after John Edwards. This launched Obama as a serious candidate and was the beginning of a rocky road for Clinton who would eventually lose the nomination that most people thought was hers. Here are the transits for the day of the Iowa caucus. One again Pluto is the culprit, but now in very late Sagittarius opposing her Gemini Ascendant and in square to her Moon at the last degree of Pisces. This was accompanied by Mars conjunct her Ascendant that should have made her more an active participant. By opposing her Ascendant degree, does Pluto signify Obama? Additionally, transiting Neptune square natal Mercury that can cloud the mind of an otherwise rational person – this transit would be operative then regardless of her birth time. Decennials were the most planetary period system often used in the ancient world and made their way into medieval astrology. According to this system, the long-range “general” periods usually begin Sun and Moon as general time lord for day and night charts respectively. (Things can become more complicated when the Sun by day or the Moon by night is in a house disconnected to the Ascendant.) Each general period lasts ten years and nine months (of 360-day years,30-day months). The general periods proceed in the order of the planets that follow the appropriate luminary in the natal chart. Within each general period are seven specific periods governed by the planets, each lasting the number of thirty-day months according to the number assigned to the planet. They proceed in the order of zodiacal position following the luminary. Unlike the general periods, however, the lengths of the specific periods in her morning and evening charts do not parallel, because these planets proceed in the order of the number assigned to each planet. We begin in 1990 with the morning chart, at the age of 42 the fourth planet that follows the Sun as general time lord is Moon (Sun then Venus then Mercury then Jupiter then Moon). Moon-Moon would last for over two years followed by Moon-Mars that would cover the time in which she gained national prominence; difficulties abounded, however, when Moon-Saturn was in place from mid-1993 until late 1995. Things improved mightily for her in 2000 when she entered a Mars-Mars period in the middle of her campaign for the Senate – not only did she acquit herself well running for office on her own, but the feared competition (Rudolf Giuliani) had dropped out for health reasons. Her unsuccessful Presidential run was governed by Mars-Jupiter and she should have done better, but now when she has had greater success, her decennials are Saturn-Mercury. Maybe it’s those damn e-mails. Using the decennials for her evening chart yields different results, some of which seem to fit quite well with the vicissitudes of her life. She moved to Little Rock to be with Bill Clinton during a Saturn-Jupiter phase nicely coincides with Jupiter being in her Seventh House of partnerships and marriage and in dignity. Her entry into national prominence came with ­Venus-Mercury that are in her First House and in mid-1992 she entered a Venus-Jupiter phase that should have worked out better for her. Quite significant, however, was that the “Monica Lewinsky affair” came to light during a Venus-Saturn period that was followed by a significant uptick in her reputation when she entered a Venus-Sun period in March 1999. Her Senate campaign happened at the beginning of a Mercury-Mercury period but her failed Presidential campaign in 2008 happened during a Mercury-Saturn period, yet that was followed by Mercury-Sun in early 2009 and she was confirmed as Secretary of State. Secondary Progressions and What About Now? Except for the angles that are moved according to an older system, secondary progressions move the chart one day per each year of a person’s life, so that if Hillary Clinton turns 69 in October her secondary progressions will be for exactly 69 days after her birth. A twenty-four-hour day in an ephemeris is thus equivalent to twelve months of a lifetime; a twelve-hour difference between two birth times would result in a six-month difference in timing for Secondary Progressions. Because 8 PM is twelve hours later than 8 AM, Hillary’s progressions for her evening chart will be exact six months before they would for the morning chart. Here is her progressed chart for right now, using her morning chart, that will show us her major progressions at this important time in her life. Since by progression Moon will move roughly one degree a month (corresponding to the Moon’s daily motion of about thirteen degrees), you see how close she is to a progressed Quarter Moon (it’s exact on September 12), Moon conjunct Neptune (exact October 8) and an all-important (especially for a politician) conjunction of Mercury and Sun that is exact on October 13. One progression that seems rather difficult for a politician is Mercury square Neptune but for her morning birth time it would not be exact until April 30. Remember that for an evening chart all progressions would be six months earlier, so that the progressed Sun-Moon, Moon-Neptune, and Sun-Mercury already happened this past spring. This was the time of her long primary duel with Bernie Sanders. What’s more striking is that in an evening chart the Neptune-Mercury progression is exact this October. Will we find some kind of October Surprise revelation that turns her candidacy into mush? Will she, and not her opponent, be subject to puzzling pronouncements, vagueness with facts and reality, and message disorientation? So far it hasn’t happened but there’s still time. I shall end on a fascinating transit coming up for Clinton that would apply to the evening chart only. The first – and by far the most important – debate is scheduled for Monday September 26 and the press has noted the exhaustive preparation by Hillary and the nonexistent preparation by her opponent. However, we should take note of the position of Mars on that day – 29◦ Sagittarius, exactly opposite her Ascendant and square her Moon! 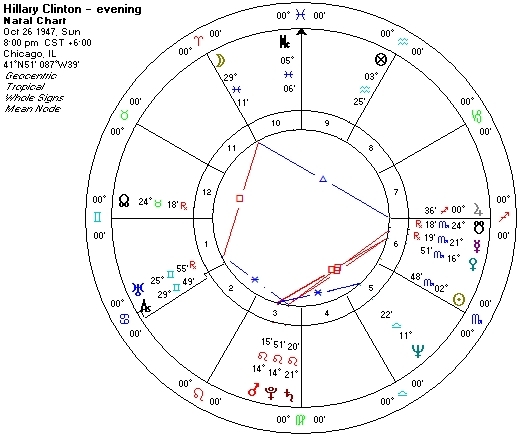 If indeed these are the correct Ascendant and Moon positions from the evening birth chart, Clinton should expect some kind of verbal Armageddon from her opponent that would take the measure of her, since the progressed Mercury-Neptune square would be also upon her. What are her decennials during this time? For an evening birth they have been Jupiter-Saturn since the summer of 2015 until the beginning of 2015; if she was born in the morning, it’s Saturn-Mercury that duplicates the square in her natal chart. If her life over this autumn favors an evening birth time, things can be very difficult for her: her opponent will press hard and her mind will be more uncertain, perhaps confused and it will be her turn to make unforced verbal errors. If, however, this autumn favors a morning birth time, her visibility and articulation will be stronger and people will feel they know her better, and she should easily coast to victory. It has taken awhile but you heard it here first. After seeing the first debate, I think we can dispense with the evening chart, and confirm Clinton’s approx. 8 AM birth time.